The ASSET test is administered by the American College Testing Corporation, the same company that developed the ACT test. It’s used by some 400 colleges in America at the present time, mostly community and technical colleges. Unlike many tests, there is no ‘passing’ score on the ASSET test. It’s more of a diagnostic tool, which helps colleges identify students’ strengths and weaknesses, find the right program for them, and identify areas they need help in. Students generally don’t take the test until after they’ve been accepted for enrollment, although some schools require it before applying for particular programs. The ASSET test consists of two parts: Basic Skills, and Advanced Mathematics. The first part consists of three sections-reading, writing, and numerical reasoning. Students are given 25 minutes to complete each section, for a total of 75 minutes. Reading has 36 questions on reading skills and comprehension:, writing has 24 questions testing for style, grammar, punctuation, etc. ; and numerical skills consists of 42 questions on basic mathematics such as decimals and fractions, and pre algebra concepts like square roots and prime numbers. The Advanced Mathematics is divided into four 25 minute long tests-elementary algebra, intermediate algebra, college algebra, and geometry. Except for college algebra, the tests cover math skills acquired in high school. All questions are multiple choice. The tests are taken with pencil and paper, and calculators are allowed for the Advanced Mathematics portion. And you’ll find out your score immediately. If you’re taking the ASSET test, you should definitely study for it, as it can help you find the right fit in your college program and schedule, and possibly enable you to skip some basic classes. But don’t be too anxious over it-you can’t ‘fail’, and the more relaxed you are the better you should do on the test. 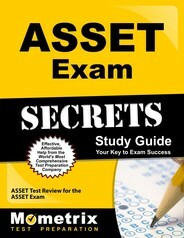 Ace the ASSET test using our ASSET exam study guide with practice questions.